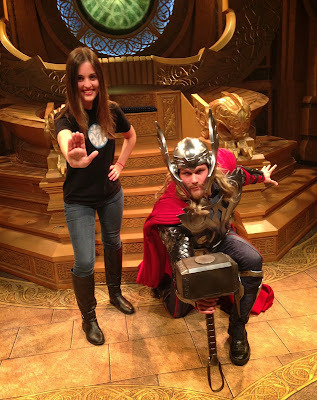 The Disney Den: Meeting Thor! At the beginning of November, Thor became available for meet and greets in Disneyland. Before he was ready to meet with guests, Disneyland cast members got to experience the exhibit and meet him in the Asgaardian throne room! Jesi and I woke up early in the morning and carpooled over to the park before her classes. Once we parked we head on over to Innoventions before the park opened to wait in line and see the Asgaardian exhibit. 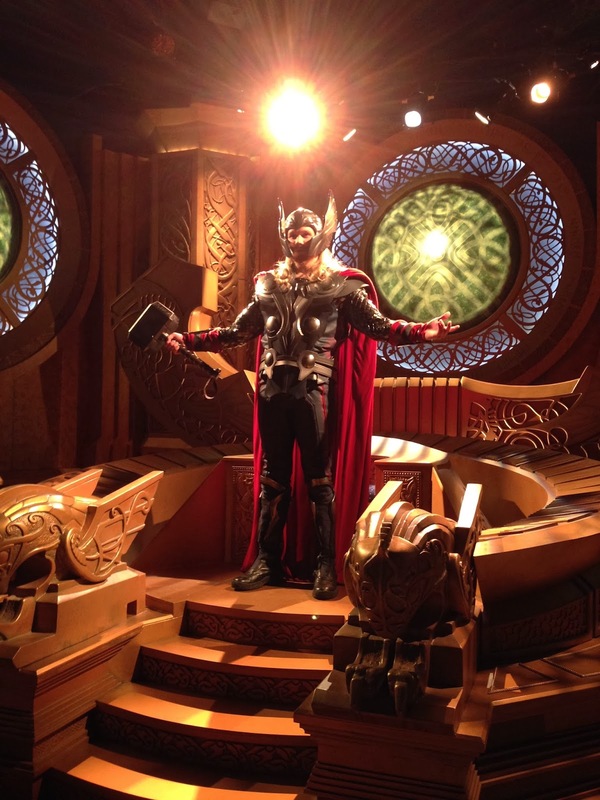 It was pretty neat to see imitation props such as weapons and Loki's helmet. After you wait in line, you walk into a room filled with these props and listen to Odin explain how Jane Porter built the exhibit for everyone on Earth as a gateway to Asgaard. After his speech, the doors open and you walk in to see Thor standing tall and proud in front of the throne. He started talking about Asgaard and then had one of the cast members in the group try and pick up his Mjolnir (the man failed, of course). After his short performance, Jesi and I were near the end of the line when they started to do meet and greets. Most of the time Thor would ask each cast member where they worked and if they wanted to pose like a fearsome warrior. When Jesi went up to meet him, he asked her about her CSUF sweatshirt, and she said she's from the home of the titans (our mascot). He got pretty excited and said he's heard of them! I thought she was pretty clever for saying that. I was curious with how Thor was going to react to the shirt I was wearing. You see, back in Florida I met Captain America in Universal Studios with my Iron Man/arc reactor shirt. Captain America didn't say anything about it, but Thor definitely noticed when I walked up to him. Thor: "Hello! I see you know my metal friend!" Me: "Yes, why yes I do!" Thor: "Now, he's not your favorite, is he?" Me: "Uhhh.....yeahhhhh he kinda is..."
Thor: *laughs* "Ah well, you seem to like the narcissistic type. It's fine, he makes a very good Avenger." Thor: "Would you like to pose like my metal friend?" If you're in Disneyland and want to meet Thor, he can be found in Tomorrowland's Innoventions on the second floor, right next to the Iron Man exhibit! In other news..I have a HUGE announcement in store for you this weekend! I'm officially done with finals, so I can film the video and share it with you guys very soon!